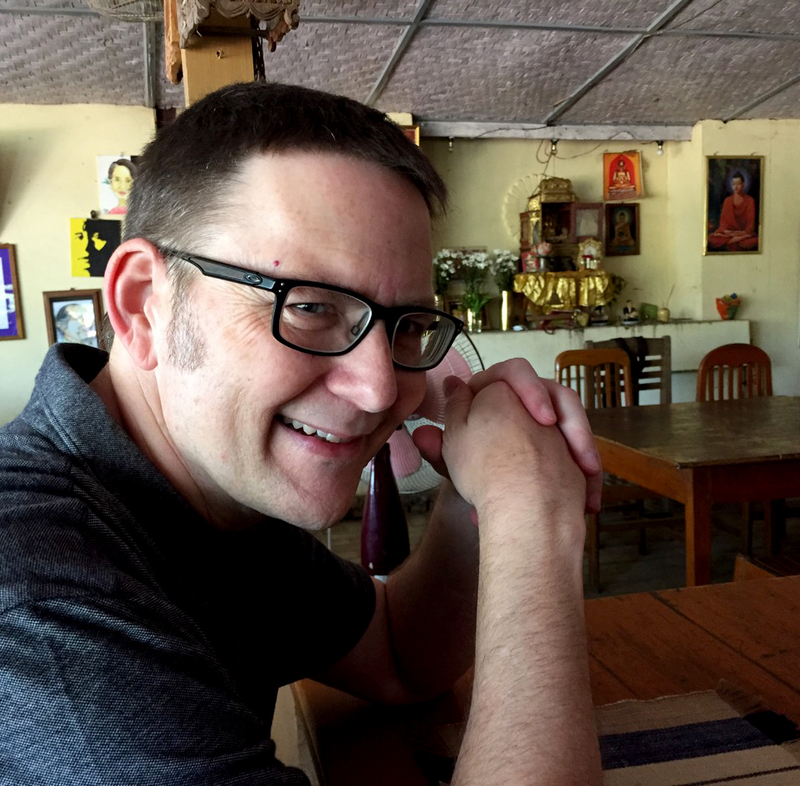 James Kuether is an award-winning artist whose paintings and photographs hang in galleries and private collections around the globe. He is an amateur fossil hunter and a life-long dinosaur enthusiast. His natural history art has appeared in numerous publications and enhances natural history museum displays in the United States and Europe. His book, "The Amazing World of Dinosaurs" features a collection of more than 160 original illustrations and was published by Adventure/Keen in October 2016. James is a member of several professional artist organizations as well as the Society for Vertebrate Paleontology. In addition to creating artwork, James has been a corporate executive, an executive coach, and a consultant to nonprofit organizations and Fortune 500 companies. He makes his home in Minneapolis, MN. Jim was kind enough to answer these questions for ExhibiTricks readers. 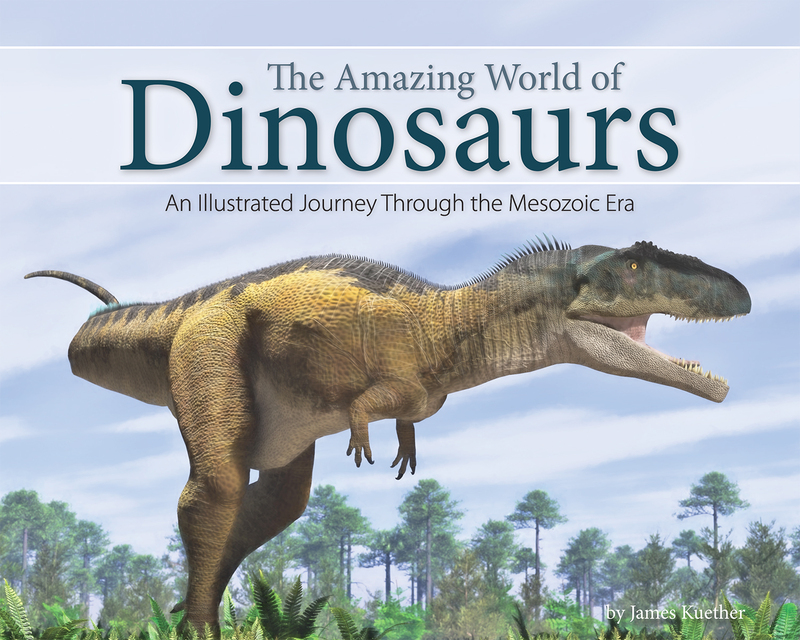 As a bonus, we'll be giving away autographed copies of "The Amazing World of Dinosaurs" to two lucky ExhibiTricks readers, so read on for more details! What’s your educational background? I have a non-traditional education. I worked in the financial services world for 25 years. During that career, I studied art, going on to become a fairly accomplished watercolorist. That experience provided a grounding in art principles and theories. At the same time, my interest in dinosaurs had me subscribing to academic journals and buying every book on the topic I could get my hands on. So regarding the disciplines of art and paleontology, I’m mostly self-taught. What got you interested in dinosaurs and dinosaur illustration? My grandparents had a ranch just outside of Rapid City, South Dakota. One of my earliest memories is of my grandmother taking me to the South Dakota School of Mines Museum in Rapid City where I saw a mounted skeleton of the duck-billed dinosaur Edmontosaurus. Right from there, we drove up to Dinosaur Hill where there were life-sized reconstructions of dinosaurs. I think I was 5 years old, and from then on, I was hooked. Regarding art, throughout my career as a watercolorist, I painted “respectable” subjects like landscapes, still lifes and traditional figures. Then about 10 years ago, 3D computer graphics became accessible and affordable for home computer systems. I began dabbling, and it was then that my passion for both dinosaurs and art really came together. What informs your design process? First and foremost it is the scientific accuracy of both the dinosaur’s anatomy and its environment. The species of vegetation that existed during the time of dinosaurs are different – in some cases very different – from those we’re familiar with today. It’s important to make sure that the plants in the images lived at the same time as the depicted dinosaurs. In addition, the same factors that influence traditional art –color, value, composition – inform the image. It’s not enough to plop some cool-looking animals into a scene. I give a lot of consideration to the behaviors of the animals and how to compose them within a scene that is not only pleasing to look at, but also feasible and consistent with current scientific knowledge. All that being said, imagination still plays a huge role in determining the coloring of the animals and the design of the landscapes. The dinosaur imagery I create is a unique combination of science and imagination. What’s your favorite dinosaur, and why? I have to admit to having a real love/hate relationship with that question. I love the question because it always sparks great discussion – especially with young people – but I hate it because, for me, it’s so hard to answer. There are currently more than 1,000 valid genera of dinosaurs, and most of those have been described in only the past 15 – 20 years! So favorite for me changes constantly. But I will say this – I always end up rooting for the underdog. 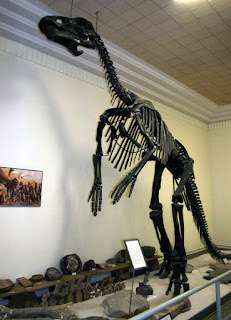 So the herbivores – especially the hadrosaurs – tend to be my favorites. Edmontosaurus isn’t a flashy dinosaur. It doesn’t have big teeth or horns or spikes. But its form and design had an elegance that I find fascinating and quite beautiful. What are some of your favorite online (or offline!) resources for people interested in finding out more about dinosaurs? There are a lot of dinosaur dictionary and encyclopedia sites. Websites like Prehistoric Wildlife and Dinopedia offer a convenient resource for finding out about your favorite dinosaur. But my favorites are the ones that focus on exciting news in the field of paleontology and dinosaurs in general. Earth Archives is a wonderful site that has lots of “breaking news” features and summaries of ground-breaking research that are presented without a lot of scientific jargon. Novataxa features the newest discoveries, not just of dinosaurs and other prehistoric animals, but of extant (living) animal discoveries as well. For off-line resources, The Princeton Field Guide to Dinosaurs by Gregory S. Paul, and Dinosaurs: The Most Complete, Up-to-date Encyclopedia for Dinosaur Lovers of All Ages by Thomas Holtz is packed with Luis Rey’s great dinosaur images. I also keep a regular list of resources on the Resources tab of my own website, so people can check there as well. What do you do when you’re not creating dinosaurs? I think about creating dinosaurs! It really is a bit of an obsession. In addition to my natural history art, I consult with non-profit organizations, specifically in Southeast Asian countries. My business background along with my passion for art and prehistory has provided me with an incredibly rich (I don’t mean that in the monetary sense) and varied life! What do you think will be the “next frontier” for dinosaur discoveries? Wow. That’s a great question and an exciting one to consider. New tools that are available to scientists are allowing us to look deeper into the microscopic details of fossils and discover aspects of dinosaur physiology we never dreamed we’d have access to. Recent discoveries of actual soft-tissue remains that have been preserved in amber, and the discovery that certain soft-tissue remains that can be coaxed from fossilized bones are providing answers to some of the most fundamental and perplexing questions about dinosaurs, such as their relationship to birds and whether they were warm blooded, cold blooded, or something else altogether. As an artist, the work being done to determine the coloration of some dinosaurs is really amazing. That work holds a lot of promise for developing ever-more accurate reconstructions of how these amazing animals looked. What are some of your favorite museums or exhibitions? It’s pretty tough to beat the American Museum of Natural History in New York. In fact, whenever I visit New York I stay right across the street from the museum so I can spend as much time there as possible! I also have a fondness for the Science Museum of Minnesota. 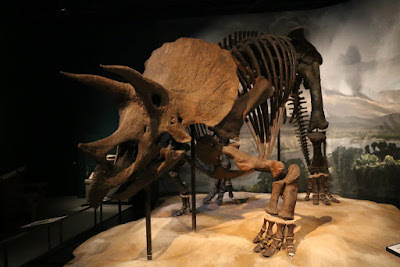 Its dinosaur and prehistoric animal collection isn’t very well known, but it’s impressive (sporting the largest mounted Triceratops in the world!) It has a special place in my heart as my hometown science museum. It was key to developing and feeding my passion. This has been a fun year. I’ve had requests from several museums around the world to use my images to accompany their fossil displays. That’s been a huge honor. My artwork has also appeared in several publications, including major books by noted paleontologists. But certainly, the publication of “The Amazing World of Dinosaurs” by Adventure/Keen publications was the biggest kick. I was given the latitude to write the book I wanted to write – something that’s a rare gift in the publishing world. As a result, I was able to give voice to the things I feel the strongest about, including the importance of science education, the role of women in science and in paleontology in particular, and the amazing beauty and grace (in addition to the innate coolness) of dinosaurs. If money were no object, what would your “dream” dinosaur project be? I love collaboration with smart, knowledgeable, passionate people, so it’s great to partner with experts to create natural history imagery. I get excited when I’m requested to change an image to match up to a specific fossil discovery. Adjusting my work to more accurately fit the science or the client’s ideal of what an animal should look or act like is when I get really pumped up about the process. If I can do that, and if the results further the science or inspire someone (and not only young people) to want to learn more about dinosaurs and ancient life, then I'm living my dream. Many thanks to Jim for sharing his thoughts with ExhibiTricks readers! You can find out more about his artwork by clicking over to his website. AND NOW FOR THE CONTEST! If you'd like a chance to win one of the two free autographed copies of Jim's book, “The Amazing World of Dinosaurs” that we'll be giving away, you can either subscribe to the ExhibiTricks blog by clicking on the link at the top right side of this webpage, OR send an email to me (Paul Orselli) with the subject "Dinosaur Book Contest" before January 31, 2017 to enter to win. We will be randomly choosing one winner from new subscribers and the other winner from the email entries on February 1, 2017. Good luck!